Lipari passenger and car ferry ticket prices, timetables, ticket reservations and information for ferries sailing from Lipari to Napoli. Compare all available Lipari ferry ticket prices in real time and book the cheapest available Lipari car and passenger ferry tickets sailing to and from Lipari, Napoli with SNAV Ferry Line ferries online with instant confirmation. Book Lipari Ferry Tickets with SNAV Ferry Line for ferries sailing from Lipari to Napoli online in advance to enjoy the cheapest available ferry ticket price. The price you see is the price you pay. There are no hidden extras or surprises such as added fuel surcharges or booking fees and we do not charge you anything extra for paying with a Visa Electron card. The price we quote you for your selected Lipari passenger or car ferry ticket, onboard accommodation and vehicle type is all you will pay, and that's a promise. To obtain a Lipari ferry ticket price and book your ferry ticket securely online please use the real time ferry booking form on the left. You are also able to add a hotel at your destination, or anywhere else, to your ferry ticket when completing your ferry ticket reservation. Lipari isle is the largest of the Aeolian Islands. It lies 22 miles from Milazzo, which is its natural link to the mainland. Its volcanic nature is revealed by its dominating colours: the white of the pomice-stones scattered all around the coastline and the black of the obsidian of Castellaccio Vecchio. The Island of Lipari is ideal for trekking. There are many routes on the island from easy to hard level. The level of difficulty depends on the season. Some tracks are very hard or almost impossible to follow during summer because of the heat. There are maps to be bought on Lipari but one has to ask local people to find some of the tracks. Lipari has spectacular beaches and breathtaking ragged coasts whose walls rise precipitously from below the sea. Besides the town of Lipari there are four more villages on the island: Canneto, Acquacalda, Quattropiani and Piano Conte. A short walk downhill can be done on the road from Quattropani to Acquacalda on the north side of Lipari. This can be done even during summer and takes about 45 minutes. You enjoy the view of Salina and the northern Aeolian islands during this walk. From the Old Kaolin Mine between Pianoconte and Quattropani it is possible to walk to the thermal bath of San Calogero or to the village of Quattropani. Downhill near the sea there is the ruin of a Saracen tower and fifthy meters away it is possible to walk down on the black clifs for a bath. Do these to walks during springtime. From Marina Corta there is a track up to Monte Gallina and Monte della Guardia. You reach the west side of the island and will enjoy the two Faraglioni from upside. You are able to reach the street that takes you from the vulcanologic observatory in front of Vulcano, back to Lipari town. You should do this hike late afternoon during summer. During afternoon in summer you can also make a walk from the church of Santa Lucia in Lipari to Valle Muria, the beach on the west side of Lipari. Lipari is the best-equipped base for island-hopping, with plenty of places to stay, eat and drink. Best Price Guarantee - We always offer you our lowest available SNAV Ferry Line passenger and car ferries ticket price to and from Lipari. There are no hidden extras or surprises such as added fuel surcharges or booking fees and we also we do not charge you anything extra for paying with a Visa Electron card. The price we quote for your selected Lipari ferry ticket, onboard accommodation and vehicle type is all you will pay, and that's a promise! In the unlikely event you find the same all inclusive Lipari ferry ticket cheaper in the brochure of any other tour operator we promise that we will do our best to beat that price or offer you the choice of requesting a refund. 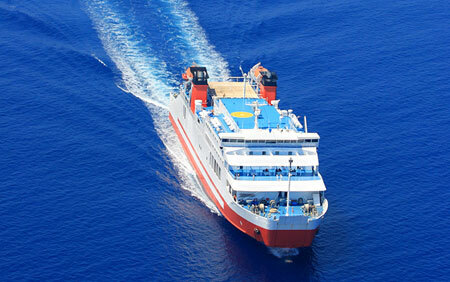 To book Lipari car and passenger ferry tickets please click here. At ferryto.com you are able to obtain live Lipari ferry ticket prices, check availability and book car and passenger ferry tickets to and from Lipari at our lowest available ticket price. Ferryto.com is part of the world's largest online ferry ticket distribution network providing the ability to book over 80 major European ferry operators including to Lipari and to over 1,200 other ferry routes throughout the UK, France, Spain, Ireland, Holland, Eastern Europe, the Mediterranean, the Baltic and North Africa.